Cardfight Pro: News: VG-BT10: Triumphant Return of the King of Knights Announced, Royal Paladins to be Absorbed into Golds? News: VG-BT10: Triumphant Return of the King of Knights Announced, Royal Paladins to be Absorbed into Golds? Today the tenth Japanese booster set of Cardfight!! 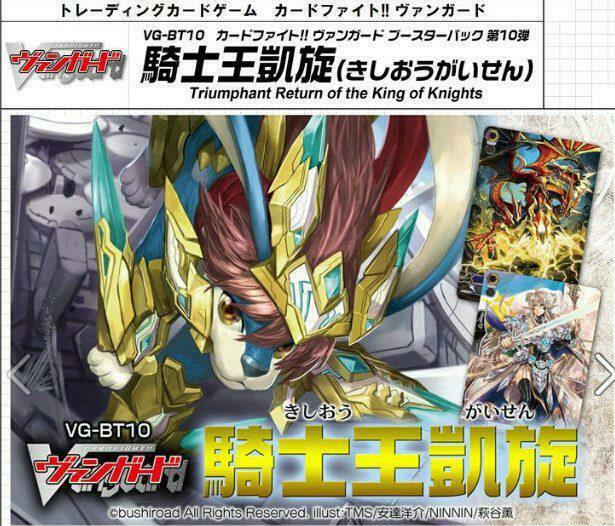 Vanguard was unveiled, BT10: Triumphant Return of the King of Knights. Prominently featuring a reimagined Wingal Brave from BT05: Twin Swords Awakening, the set is already confirmed to contain a new King of Knights, Alfred card. Although not officially confirmed, speculation is turning wild as it appears that Cardfight's first ever clan, the Royal Paladins, are going to be absorbed into the Gold Paladins entirely, replacing the franchise's centerpiece. This is seemingly supported by previously speculation concerning TD08 and TD09, which implied that the year-long seal on the Royal Paladins, Shadow Paladins and Kagerou would be finally lifted. Details are currently scarce about the set, but from what has already been announced this will, like the new trial decks, contain cards from the third season. The Shadow Paladins are known to be receiving a new first vanguard and play style, so the return of the Royals as Gold Paladins may be timed to coincide with the reemergence of their old foe. The set will contain 102 cards, like BT09 before it, and the release date is February 26, 2013. Incidentally, this will be the two-year anniversary of Alfred's anime debut, as ride 08: "The King of Knights Enters The Fray!" aired on February 26, 2011. While the return of the old cast is well received, their possible absorption by the Gold Paladins is less so. For many viewers, the Gold Paladins represent the lowest point of the franchise, directly correlated with a perceived drop in quality during the first seventeen Asia Circuit episodes, and with the rise of Gold dominance in the western pro scene. The return of the Royals is something that has been highly anticipated since the Gold Paladins first took over, as has the possibility of a new play style do displace their established Blaster proliferation; similar concerns exist for Kagerou fans, to whom the original Dragonic Overlord remains a beloved figure, and who stands to undergo similar absorption into Narukami, as implied by TD07 being for that clan.